Banana plants are ideal for the home landscape, whether you're growing them for their fruit or ornamental use. There are a few reasons why you might want to kill roots of banana plants, which are often incorrectly called trees. Banana plants have a rhizomatic root system and send new stalks up, producing a series of stems that develop into active fruiting plants. The shallow but extensive root system and these spreading shoots can cause crowding and competition. Complete removal of these root parts and their buds is necessary for control. Killing root sections of the plant can involve chopping, if you wish to retain the plant, or herbicide for the purpose of killing the entire plant. 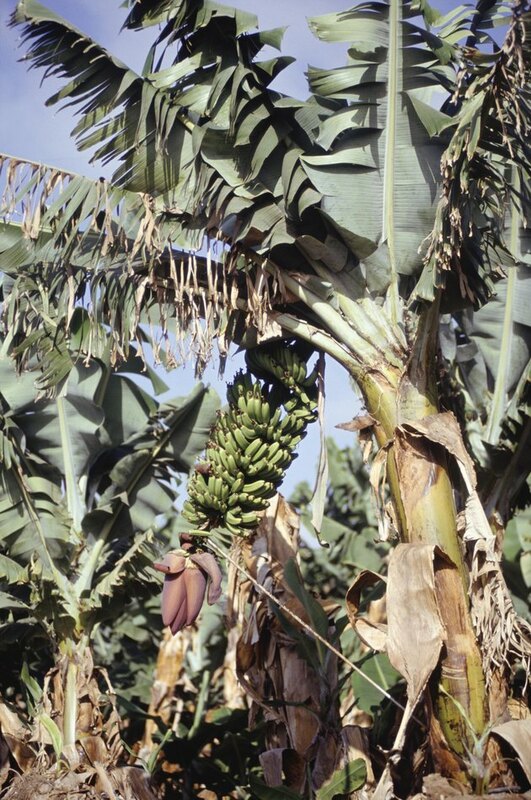 Banana trees may be grown for ornamental value or for their fruit. Cut off any unwanted suckers or shoots that are growing from the root system using a sharp spade. Remove the sucker, then cut and gouge the remaining underground bud with the spade. If the internal bud is not killed, the sucker will regrow. Too many of these shoots can crowd plants and reduce productivity. It's best to retain one active plant, a second one that is half grown and a smaller, growing sucker. Each plant will enter a fruiting and flowering stage and be replaced by the next plant once it dies. Remove unwanted rhizome sections by cutting with a sharp spade. It should be easy to reach the roots, as they tend to be quite shallow in banana plants. Sometimes the extensive root system, which can reach 18 feet long, becomes invasive to other plants. Cut these roots close to the plant itself to shorten and detach them, reducing their spread. Keep in mind this can damage the plant or slow its growth. Dig around a root or plant with a spade and remove the root section from soil. To kill remaining roots of a plant that has been cut down, apply concentrated glyphosate herbicide to the entire surface of the root.